Wild fire gutted some parts of the settlement of Sodom and Gomorro near Agbogbloshie, a suburb of Accra. A lighted candle caused the faire according to eyewitnesses. Although no lives were lost, about 50 wooden structures housing the settlers were razed to the ground. Before last night's incident, there had been several attempts to relocate the inhabitant's form the area but all the attempts have so far failed. At a point the settlers who are seen as squatters went to court over the moves to relocate them. In this part of town, what many will refer to, as houses are virtually non-existent. 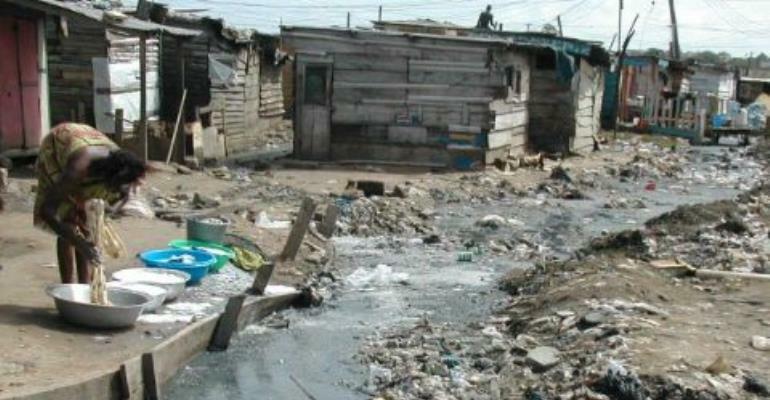 The Majority of the people live in ramshackle strictures that have been constructed out of the wooden and Aluminum sheets. Spaces between such structures live a lot to be desired. The fire Service had it tough getting to the scene. An eyewitness spoke to Joy News about the possible cause of the fire outbreak. The eyewitness said the fire could have started as a result of a candle lit in one of the rooms even though the inhabitants have been asked to refrain from the use of candles in their rooms. Cadet officer Tetteh Doku who was part of the fire service team that put out the fire told Joy News that the team's work was seriously hampered by the lack of clear access in the area. Mr. Doku explained that some of their tenders were tearing some of the electrical cables that have been illegally connected. “In fact I think we have to report this to the authorities so that the right thing is done”, he said.